Palestinian Foreign Minister Riad Malki has threatened to sue Britain for issuing the 1917 Balfour Declaration because, he claims, that it led to mass Jewish immigration to British Mandate Palestine "at the expense of our Palestinian people." The Palestinian threat is not as laughable as it sounds. It's not unexpected either, as part of the current Palestinian strategy to exploit any law and abuse any forum to delegitimise Israel. The Balfour Declaration, named after then-UK Foreign Secretary Lord Arthur Balfour, pledged Britain's support for the establishment "in Palestine of a national home for the Jewish people." 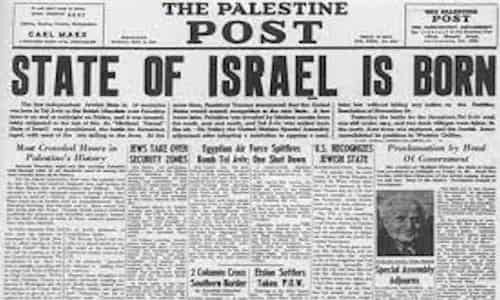 This was not intended to be at the expense of the local Arabs, whose civil rights would not be prejudiced: later, the 1936 Peel Commission proposed to partition western Palestine into an Arab, as well as a Jewish state. "Nearly a century has passed since the issuance of the Balfour Declaration in 1917," Malki was quoted as recently saying,"And based on this ill-omened promise hundreds of thousands of Jews were moved from Europe and elsewhere to Palestine at the expense of our Palestinian people whose parents and grandparents had lived for thousands of years on the soil of their homeland." Almost every word in Malki's statement is a lie. Britain reneged on its promises to the Zionists. It gave 70 percent of Palestine to Transjordan in 1921 and curtailed Jewish emigration, sealing the fate of countless Jews trapped in Nazi-occupied Europe. No Arab states were enjoined to respect the civil rights of their Jewish citizens. These Jews were unceremoniously thrown out of the Arab world without apology and without compensation -- and their pre-Islamic communities were destroyed. The Palestinians say they cannot be held responsible for what happened to the Jewish refugees. While Israel can legitimately discuss Palestinian refugees in peace talks, Jewish refugees would have to address their grievances with the Arab states. Arab League states, which instigated the 1948 war against Israel, did indeed create both sets of refugees. However, an extremist Palestinian leadership, which collaborated with the Nazis and incited anti-Jewish hatred all over the Arab world, dragged five Arab states into conflict with the new Jewish state -- a conflict they lost and whose consequences they must suffer. The Palestinian move to sue is as if Germans sued the Allies for starting World War II. From the outset, the Palestinian cause was a pan-Arab nationalist cause. It has also a powerful Islamist, antisemitic dimension. In Arab eyes, the Jews have no claim to a single inch of "Palestine." Every Balfour Declaration anniversary, Arab mobs took to the streets, and the demonstrations often degenerated into full-blown riots, as in Egypt and Libya in 1945, when 130 Jews were murdered. Not only did the Palestinian Mufti of Jerusalem, Haj Amin al-Husseini, instigate deadly disturbances in Palestine in 1920 and 1929, but he used the Balfour Declaration as a rallying cry to incite persecution against the Jews of the Arab world. The Jerusalem Islamic Congress of 1931, called by the Mufti, was followed by violence in Morocco, Tunisia, Yemen, and Aden. All this well before the creation of the state of Israel. But the worst incitement, with the deadliest consequences, took place in Iraq: the Mufti fled to Berlin after being implicated in a failed pro-Nazi coup, but not before he had primed the Arabs of Baghdad to unleash the Farhud of 1941. The pogrom claimed the lives of at least 179 Jews. This was the first battle in the Palestinian war against the defenseless Jews of the Arab world. Had the Nazis been victorious, the Mufti wanted to oversee the Jews' extermination, not just in Palestine but throughout the Middle East and North Africa. It is these Jews who have been denied justice, the right to compensation for their loss of assets and land several times the size of Israel itself, and the human rights abuses they suffered. It is these Jews who have every right to sue those who wronged them. Originally published at Algemeiner - reposted with permission.